A national Valentine’s Day campaign was launched today to pressure politicians to close down puppy mills in Canada. The letter-writing campaign was inspired by Ruby, a survivor of a puppy mill whose health was seriously compromised by six caged years of life in a mill as a breeding dog. Ruby, who was rescued by campaign organizer and author Mary Giuffre of Bewdley, died just two years after her rescue. The Ruby Campaign is intended to urge politicians to toughen laws and stop the growth of this underground multi-million dollar business. Giuffre and her partner, Paul L. Clark, have set up a Facebook group with easy-to-follow instructions, sample letters and the mailing address of the prime minister, every MP, MPP and MLA in Canada and ministers responsible for animal welfare. “Angel in a Dog Suit”. Illustrations from the children’s book by Kawarthas authors Mary Giuffre and Paul L. Clark. “Postage to elected federal representatives is free, so all we ask people to do is print off the letter, purchase red envelopes, and send them off,” says Giuffre. 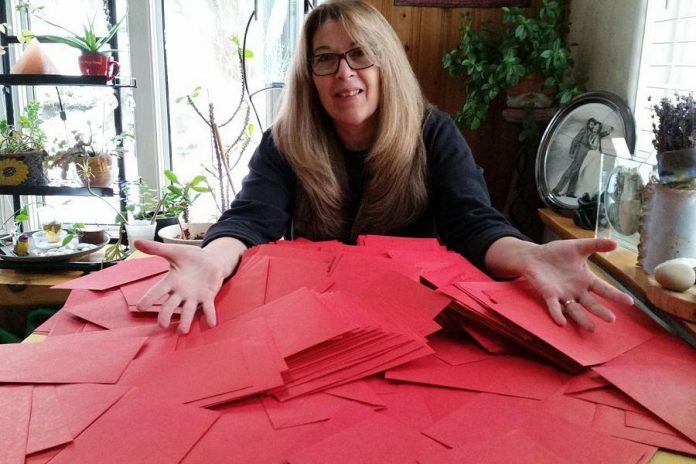 She hopes each person will send at least four letters: one to the prime minister, one each to their MP, MPP or MLA and one to the minister responsible for animal welfare either federally or provincially. Giuffre and Clark have already written an award-winning children’s picture book about Ruby’s life. Called Angel in a Dog Suit, it has been endorsed by the Ontario SPCA. Mary Giuffre with Ruby, who she rescued after six years in a puppy mill. Ruby died two years after being rescued. The International Humane Society defines a puppy mill as a breeding operation where puppies are mass-produced in substandard conditions. The goal is to produce as many puppies as possible with minimal cost and maximum financial gain for the operator. Breeding dogs are often forced to their lives in cages without exercise or human contact, and the media is filled with stories of dog rescue volunteers finding thousands of them underfed, filthy and sick, denied proper veterinary care. While firm statistics are scarce because mills are often run in secret to avoid the watchful eyes of Humane Societies across Canada, the Society for the Protection of Animals Canada estimates that, in Quebec alone, there are between 1,500 and 1,800 puppy mills operating, generating the birth of about 400,000 puppies per year. The Ruby campaign founders found a champion in MP Nathaniel Erskine-Smith, Beaches East York, who was already working on strengthening animal welfare legislation in Canada and accepted their input. “I’ll be introducing legislation this month to update our animal welfare laws into the 21st century to protect our animals across the country,” he says in the Ruby campaign video. Erskine-Smith calls on people to support the Ruby campaign and write to their local MP to stop puppy mills. For more information about the Ruby’s Love Letter campaign, visit rubyslegacy.wordpress.com and the Ruby’s Love Letter Legacy group on Facebook. All photos courtesy of Ruby’s Love Letter Campaign / Facebook.